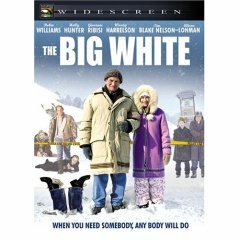 The Big White script by Collin Friesen April 29, 2004 production draft. Now available on DVD from Best Buy. Screenplay by Collin Friesen. Directed by Mark Mylod. Starring Robin Williams, Holly Hunter, Giovanni Ribisi, Woody Harrelson, Tim Blake Nelson and W. Earl Brown. Entries (RSS) and Comments (RSS) | 11 queries. 2.046 seconds. Copyright © 1999-2006 Simply Scripts. All rights reserved.